Yesterday evening we found one of our original hens hunched up under a tree by a wall looking very sorry for herself. A quick inspection showed that both eyes were swollen and there were signs of dried blood along the comb. Having already lost one of our original 3 hens only last month I’d hate to think that another one was on the way out. She was very listless and didn’t resist being picked up or carried but then she is the tamest of the 2 original hens. As far as I can tell this hen was fine at around lunchtime yesterday so whatever happened could only have been in the few hours before she was found at about 5:30pm. We isolated her in an outbuilding overnight using a spare run for some additional protection and provided water and food although I doubt she was interested. Thankfully when I checked first thing this morning she was not looking any worse so perhaps a gentle clean up and a few days TLC will help her pull through. The other remaining original hen has a bare patch on the breast with no feathers and some raw looking skin. Unfortunately she has never been interested in being handled so we can’t check as well as we would like but at least she is still eating and active (i.e. she runs away from us!). a result of fighting with the other hens we inherited with the property but there have been no sign of problems in the two months since we got here. some unwanted attention from the rooster which were resisted and led to fighting but there is no sign of feather damage/loss around the neck and sides which I might have expected in this case. an unidentified predator which tried to attack the two original hens (they tend to stay together) but which was successfully fought off by them (I’m told we have no foxes around here though). 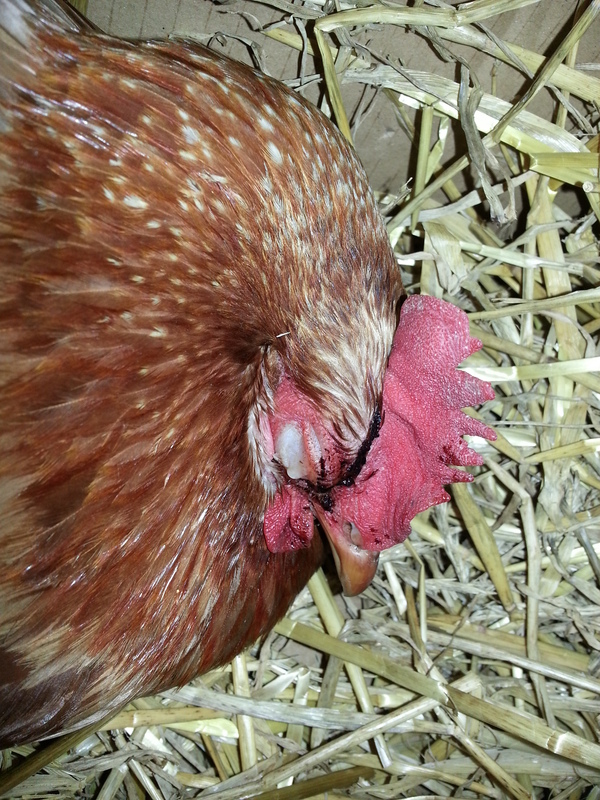 I can see how the blood on the comb could be the result of fighting either with other chickens or perhaps with a predator but I’m not sure how that relates to the swollen eyes. The other original hen is bright eyed and looking perfectly good this morning – apart from the feather loss under the breast bone. I’m keeping my fingers crossed for a good recovery in preference to a visit to the vet or worse maybe. Looking like this, I’d say unlikely to last too long I’m afraid… Chickens will disguise illness for a long time until suddenly they are seriously ill and often it is then too late. Her sleepiness could be caused by any number of diseases and the blood to the comb again could be a number of things, most likely to be bullying though from others in the flock before you separated her. The pecking order is a funny thing but if a hen falls ill, others will often bully her to raise their position in the flock. Swollen eyes are usually caused by upper respiratory infection. So, for example Mycoplasma Gallisepticum, a common disease will weaken the bird, and then secondary infection in the respiratory tract causes these signs and symptoms we recognise and call “Mycoplasma”. Good luck, I hope she recovers. « Do pigs have allergies?